Prince William County Police Department’s crime report for Sept. 2, 2011.
held a dedication and ribbon-cutting ceremony. The 57th elementary school was opened by its community of students, teachers, special guests and families, who exhibited enthusiasm for the new school with a standing-room only audience. 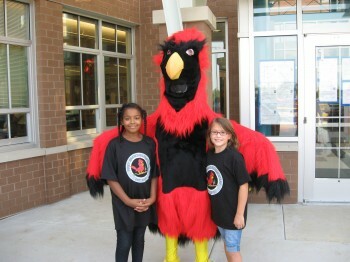 Two students are shown here at the new Piney Branch Elementary school pause with the school’s Cardinal mascot. Prince William County Police Department’s crime report for Sept. 1, 2011. Stay Alert: 800 School Buses Will Roll on Sept. 6 in Prince William County. Prince William County Police Department’s crime report for Aug. 31, 2011. Some 650 teachers joined Prince William County Schools’ ranks for the 2011-12 school year. Some just graduated from college, others have taught for years elsewhere and still others have had careers in other professions but are joining the ranks of the teachers in the county. Prince William County Police Department’s crime report for Aug. 30, 2011. Prince William County Police Department’s crime report for Aug. 29, 2011.